Own Preacher - Cassidy Smile Mug from Deff, DVD, Blu-Ray & 4K Video Specialists - Free UK Delivery..
Own Preacher - Characters Mug from Deff, DVD, Blu-Ray & 4K Video Specialists - Free UK Delivery..
Own Preacher - Jesse Good Guys Mug from Deff, DVD, Blu-Ray & 4K Video Specialists - Free UK Delivery..
Own Preacher - Key Art Mug from Deff, DVD, Blu-Ray & 4K Video Specialists - Free UK Delivery..
Based on the hit comic book series, Preacher is the edgy story of Jesse Custer, a conflicted preacher in a small Texas town who is inhabited by a mysterious entity that allows him to develop a highly unconventional power. With his fearless sidekicks, Tulip and Cassidy, he embarks on a wild, dark journey that is unlike any other. Special Features Gag Reel, Chainsaw Fight Breakdown, Behind The Killing Machine: Saint Of Killers, Deleted &..
Own Preacher Season 1 DVD from Deff, DVD, Blu-Ray & 4K Video Specialists - Free UK Delivery.. 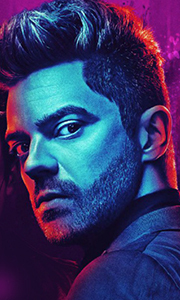 The second season of “Preacher” is a genre-bending thrill ride that follows West Texas preacher Jesse Custer (Dominic Cooper), his badass ex-girlfriend Tulip (Academy Award nominee Ruth Negga) and Irish vampire Cassidy (Joseph Gilgun) as they embark on a road trip to find God and are thrust into a twisted battle spanning Heaven, Hell and everywhere in between. Special Features Raising The Stakes: Action On Set, Gag Reel..
Own Preacher Season 2 DVD from Deff, DVD, Blu-Ray & 4K Video Specialists - Free UK Delivery..